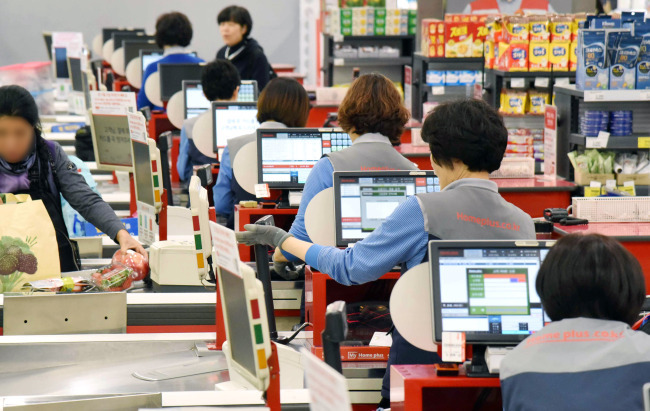 South Korean discount chain operator Homeplus will grant full-time and permanent employment status to some 600 contract workers at its stores, starting from Saturday. The move comes five months after the company converted the status of some 430 contract workers to regular positions. This year, a total of 1,200 Homeplus workers would have been converted to full-time and permanent positions, including 600 contract workers and security guards whose contracts end this year. They will receive the same level of salary, welfare benefits and promotion opportunities as other full-time employees, the company said. “For the first time as a discount chain company in Korea, we have conducted a large-scale job status transition for our contract workers. This was possible thanks to our employees who tried to solve the issue of contract employment wisely,” said Homeplus CEO Lim Il-soon. Homeplus said such efforts are in line with President Moon Jae-in’s push to better protect the rights of irregular workers and offer them job security in the public sector. The company said about 98 percent of the workers who will be granted regular positions are women. More than 68 percent of them are in their 50s, followed by 28.9 percent in their 40s and 2.7 percent in their 30s.